Ernest Jones was born in 1887 in the suburbs of Manchester, England. He was kinsman to the art of making golf clubs and at age twelve, upon his father’s death, was apprenticed to a local clubmaker. By the age of sixteen Jones had his own shop in town and was acquiring a reputation not only as a skilled clubmaker but an aspiring player. In 1905, at the age of eighteen, he gave up his shop to become the assistant professional at Chislehurst Golf Club, a near-championship course with a classic styled clubhouse. When Jones accepted the position he thought he was being hired exclusively for his clubmaking and playing skills, however he soon learned that he was expected to give golf lessons as well. In a frenzy he set out to learn all he could about teaching golf. Jones took much of his theory from Sir Walter Simpson’s golf instruction book, The Art of Golf, published in 1887. Simpson led Jones to see the golf swing as a simple but elusive art - the art of swinging the clubhead with the hands and fingers and feeling the swing therein. Although teaching golf was part of his profession, his passion was playing golf. 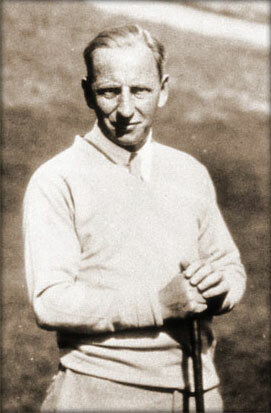 During the next nine years Jones would become a talented player, winning the Kent Open in 1914, and showing consistently well in the British Open. In 1913, at age 25, he was made head pro at Chislehurst. In his young career, Ernest Jones had worked very hard at his profession, and was poised to become a successful tournament player. Jones was a patriot and in mid 1914, when the call to WWI was sounded as with many other golf professionals, he answered by enlisting. In March 1915, while he was serving with the Sportsman's Battalion in France, he was hit with a grenade, and his right leg just below the knee had to be amputated. Four months later, on the day he left the hospital, he shot an 83 at the Royal Norwich Links, swinging on one leg. One week later he shocked the golf world by posting a remarkable 70 at his home club. Playing one good round was do-able, however the physical demands of playing four-day tournaments on one leg was overwhelming. Ernest would give-up his desire to play tournament golf and re-focus his attention on teaching and studying the mechanics of a proper golf swing. In 1923, upon the completion of the Women’s National Golf Tennis Club, on Long Island, Marion Hollins recruited Jones from his native England to come to New York to be the club’s Head Professional. In addition to teaching at the Women’s National, Jones also set up a studio at 518 Fifth Avene, in the heart of Manhattan, where he would teach lessons in what may be considered the first indoor range. During this same time period, Angel de la Torre came to New York from Spain to be the head professional at the Timberpoint Club, East Islip. Angel would soon join Ernest at the Women’s National, and would become a true believer in the Ernest Jones method. As a product of their friendship Angel would end up at Pasatiempo as the first head pro. Angel and his family would stay on the west coast November through March, from 1928 through 1931. Ernest Jones would soon follow, becoming the resident teaching professional at Pasatiempo from 1930 through 1932. One of Ernest Jones’s most notable students, Alister Mackenzie, says of Jones, "Ernest Jones is perhaps the world's most successful teacher." Jones tutored Virginia Van Wie for many years, including during her stretch of three consecutive U.S. Women's Amateur Championships from 1932-34. He also worked with Glenna Collett Vare, Lawson Little, and other top players of the era. The average pro gives around 600 lessons per year. Jones taught approximately 3,000 lessons per year. "Frequently, the half hour that Jones allots to each student turns into an hour, while the next pupil stands by. By midafternoon it is not uncommon to find six pupils stacked up, a malpractice that has cost Jones his lunch hour for decades. Somehow or other the last pupil is accommodated by 4:30, when Jones retires to the Brass Rail across Fifth Avenue for a drink that in some circles is considered no less heretical than Jones himself. It consists of whisky, water and lemon juice in equal proportions, which he downs in one gulp." Even at age 67, "he arrived at his studio wearing a double-breasted blue serge suit, with a boutonniere from the garden of his Long Island home. Of conservative English background, with a heroic military record in the Royal Fusiliers, he hasn't a sports shirt to his name." Jones was one of the first instructors to use the available media to disseminate his theories. He was a contributor for many years to the magazine The American Golfer, and he wrote two instruction books; Swing The Clubhead debuted in 1937 and Swinging Into Golf , in 1957. Both books embody all Jones’ thinking on the golf swing. His highly successful 60-year career in teaching the ideas contained in Swing the Clubhead was memorialized when he became one of only seven golf instructors inducted in the Golf Hall of Fame. "The golf swing can be readily taught and consistently performed," writes Jones, "but only if it is conceived as one, overall movement. The body and all its parts should be treated as disastrous leaders but wholly admirable followers of the actions of the hands and fingers." Currently, there are many excellent golf schools including, Rancho Vista, Frankel, Al Franzzini, Jim Dent and Rick Bradshaw, and the Manuel De la Torre Heartland Golf Schools, that base their teaching curriculum around the Ernest Jones Method.